Birth control pills are also known as oral contraceptives. They are used in order to prevent unwanted pregnancies. 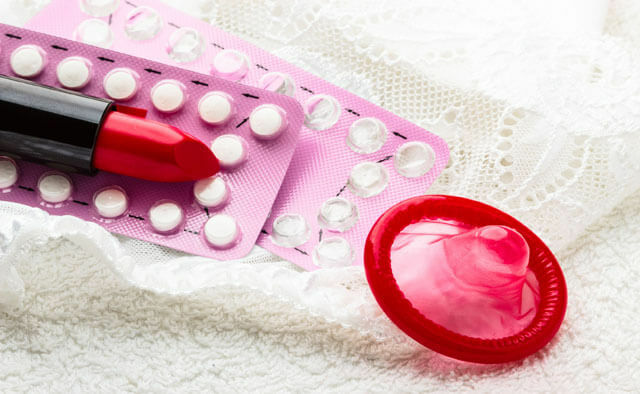 Birth control pills are part of temporary contraceptive methods. Oral birth control pills are taken daily. Most pills contain two types of synthetic female hormones: estrogen and progestin. The estrogen and progestin that are part of the pills are similar to the estrogen and progesterone which are normally produced by the ovaries. The hormones in the pills prevent pregnancy interfering the ovulation process. They suppress the pituitary gland which stops the development and the release of the egg from the ovaries. Progestin also helps prevent the sperm from reaching the egg and fertilize it by changing the uterus lining. How Effective are Oral Birth Control Pills? Birth control pills are very effective if they are taken just as described. Each day one pill should be taken at the same time. Keep in mind that oral birth control pills prevent unwanted pregnancies, but they don’t protect you from sexually transmitted diseases. By using condoms you will decrease the chances of getting a sexually transmitted disease. Oral birth control pills are very safe and most of the women don’t have any side effects. However, side effects like irregular periods, nausea, headaches, weight gain, etc., are possible. Headaches – may occur for other medical reasons, but birth control pills can make these headaches worse. Irregular periods – Spotting or very light bleeding are possible during the first few weeks after taking the birth control pills for the first time. Consult your health care provider if you should continue using birth control pills, or you should switch to another birth control method. Nausea – is possible in the first few days after taking the birth control pills for the first time. It is more likely to occur in cases when the pill is taken right before or after a meal. Mood changes – are possible when taking the birth control pills for the first time. However, mood changes are normal in a person’s life and they are usually not related to the pills. Leading a healthy and normal life with lots of daily activity that can help you relax and get away stress will help in the first few weeks. Sore or enlarged breasts – sometimes the breasts can get larger or tender after taking birth control pills for the first time. Usually these signs and symptoms will go away after a few weeks or months. Weight change – are also possible. Keep in mind to eat healthy food, drink a lot of water daily and exercise. Avoid eating unhealthy food. Can Everyone Use Birth Control Pills? As mentioned before, birth control pills are very safe and almost all teens and young women can take them without having any side effects. However, in some cases birth control pills are contraindicated. Problems with blood clotting, especially a family history of blood clots or genetic problems. Migraine headaches accompanied by aura or neurological symptoms. Recent surgery which will prevent the women from leading a normal daily activity. Even though birth control pills are safe and one of the best birth control methods with up to 99% effect, for some women they are just not the right method. Talk to your health care provider if you don’t feel comfortable taking the birth control pills. Maybe some other birth control method is more convenient for you.